MICHAEL A. MESSNER is a professor of sociology and gender studies at the University of Southern California in Los Angeles. He is the author or editor of many books, including Some Men: Feminist Allies and the Movement to End Violence Against Women, King of the Wild Suburb: A Memoir of Fathers, Sons and Guns, and No Slam Dunk: Gender, Sport and the Unevenness of Social Change (Rutgers University Press). “There is a revelation on every page of Guys Like Me. The journey any man takes to transform his sense of his own manliness isn’t direct or simple. And, as Michael Messner shows us in these five engaging life histories, each gendered journey will have added twists and turns when distorted by militarism. A truly humane book." 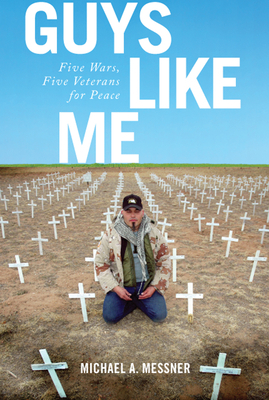 "With Guys Like Me, Michael Messner delivers an eloquent, passionate, and moving account of how war has sometimes moved veterans towards peace. Messner’s interviewees give us hope that humanity might yet one day listen to the soldiers who have gone to war, the ones who tell us, again and again, that war’s devastation is never worth it." "Michael Messner is our new Studs Terkel. His five men speak with extraordinary eloquence about the psychic wounds they suffered in war, and the moral odysseys they undertook to break the silence that surrounds the human cost of war in the United States. Each man fought in a different war, but each tells a common story of exploitation by their own government and a descent into numbness, followed by redemption. These men form an intergenerational chain reflecting with honesty and courage on masculinity and war. Messner describes and analyzes their experiences with warmth and insight. Essential reading for those seeking to understand military veterans." "Messner's narrative points the way for other activists seeking to build popular opposition movements." "This book tells the stories of five veterans of five U.S. wars: WWII, Korea, Vietnam, and Iraq Parts I and II. We learn their stories from long before they entered the military through long after they left it. The stories are well-told, with subtlety and complexity, not museum-like propaganda. Patterns become evident without the book becoming repetitious. Each person is unique, but each confronts the same monster." "All five [veterans] are unique and engaging storytellers who pack the book with human interest....The testimonies of these varied, thoughtful, and racially diverse veterans are at stark odds with the cinematic ads we see of government-approved pro-war imagery, and it’s important they be heard." "Guys Like Me is well written; Messner does a fine job of telling the men’s stories, conveying the complexity of their struggles by sharing their words and providing vivid details about their lives. What we see are real people, confused and lost at times, trying to reclaim their humanity and repair the damage caused by participating in organized violence."